1) I needle very aggressively. I needle the scar a lot, trying to hit every single part of it, as well as a bit outside of it. I probably hit the same spots of the scar several times. I basically do it until I can't take it anymore in that area. All of my scars, even the ones on the nose, have either stayed the same or improved. However, I read somewhere that you should actually leave parts of the scar unneedled so the good cells can send stuff to the bad ones or something like that. Is this true? Should I not try to needle the entire scarred area? 2) At the moment, all I am doing is needling. I am not applying anything to them. How much of a difference does applying stuff like vit C and A make? Or copper peptides? I am concerned about the possible redness/irritation that could follow. But I do wonder if the results would be better and faster if I did apply something. And if so, what would you recommend? The infadolan stuff just seems like a moisturizer basically? How necessary is the retin a? That stuff I know can irritate my skin a lot. If I were to apply infadolan, how often would I apply it? And for the vitamin c, I understand it is about 2-3 times a week. In the instructions you say to apply vitamin c serum 4 days prior to needling...is that just that one night 4 days before you needle or do you apply it every day leading up to needling? Also, I understand that you need to strip the skin of oil before applying vitamin c. I stopped using all facial cleansers and that has definitely helped my acne. How would you suggest I go about getting rid of the oil prior to applying vitamin c? Could this be done with just a tissue or water or maybe those salicylic acid pads? And how would I get the vitamin c off of my face the next morning? 3) Is there anything that you recommend taking orally to help boost collagen production and scar remodeling? I am treating both indented and hypertrophic scars. I heard that 1g of vitamin C, 1g of MSM, and 5g of flaxseed oil a day helps. Currently I am taking fish oil, primrose oil, probiotics and a multivitamin that has 300mg vit C and 10,000 IU vit A total. I also get a lot of protein and amino acids which I heard helps. 4) Is it true that you should avoid rubbing or touching areas after you needle them? I saw somewhere that the new skin coming in is extremely fragile and rubbing the area can actually tear or break this down. I ask because many of my scars are on the nose where I frequently take a tissue and rub all the excess oil off because for some reason that area gets very oily. Also, I have indented scars right next to hypertrophic ones and apply pressure to the area 1-2 times a day to try to bring them down. 5) Speaking of hypertrophic scars, would I apply infadolan and vitamin c serum to them? Would it help/hurt my goal of trying to bring them down? For treating these scars I have just been stamping and needling them very aggressively, just like the indented scars, and apply pressure for 20-30 seconds 1-2 times a day. A lot of questions, I know. I thank you in advance for taking the time to address them. I'll be happy to answer other peoples questions as to what I've been doing to get results...though I pretty much covered all of that in my questions. Wow those are a bunch of questions. Sarah say's to needle the scar and a little around it so I would not leave parts of the scar unneedled. Needling alone is the main thing that will cause the magic to happen. The things you use prior (vit. C, A) will help the process. You don't want to use C or retin-a immediately after single needling. Use those in the days prior. Infadolan is perfect to use after. I suggest more reading here about Infadolan. Retin-a is awesome if used correctly. Many don't and complain that it causes too much irritation. Start out with the lowest strength and use a couple times a week and you should be fine. Gradually work up to .05% strength every other day. Infadolan can be used as often as you need it after needling. But it is greasy so most only use it for a short while after. Apply the vitamin C serum 4 days prior if you just begun, or many days prior, or dont use it. The magic is in the needling. You could use a toner to rid your skin of oils. The vitamin C is not washed off the next morning. It will be absorbed into your skin and cant be washed off. The benefits will last up to 72 hours. This is all assuming your using a quality C serum. Oral supplements help with general health but to boost collagen production and scar remodeling, your not going to see much, if any, effect from taking supplements. They are working, but in the long term. I would only be concerned about touching, rubbing the area just needled in the immediate hour or so after needling. Yes you can apply vitamin C and Infadolan to hypertrophic scars. Thank you, Mustardseed, for your reply. 1- You can needle aggressively, there is no problem. Microneedling does not remove layers of skin so it always heals very quickly no matter how densely you needle. There are so many skin cells in one scar that you cannot even hit all of them and the cells will migrate from the surrounding tissue and that is also a reason why it heals so quickly. 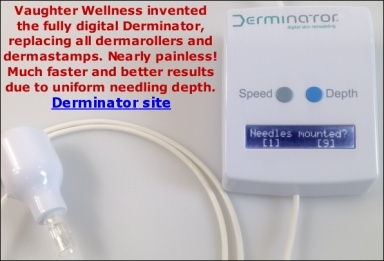 In reply #14 in this forum thread: http://forums.owndoc.com/dermarolling-microneedling/my-1-year-dermaroll-experience-for-acne-scars-%2815-sessions%29/msg5502/#msg5502 our forum member describes he only got results after starting to needle aggressively (it is not always the case). I do not recommend needling/stamping the nose aggressively unless you started gently and tested several times how the scars on the nose react because this area is tricky and can heal unpredictably. In your case it turned out OK so you can do it aggressively even on the nose. But in this area, initial very gentle treatment testing is a must. 2- Microneedling works without using any additional products. Supplying the skin with vitamins helps forming "ideal" conditions in the skin for collagen production etc. Infadolan contains vit. A and D and is semi- occlusive (keeps the moisture in). It should be applied until the treated area heals and goes back to normal. If you are prone to acne, do not apply Infadolan more than right after the treatment and use creams that you know do not break you out. If you want to make sure your skin is saturated with vit. C for the "needling day", apply it for four consecutive days prior to needling and then continue applying a few times a week. You do not have to remove natural skin oils to apply vit. C but vit. C is not going to penetrate a layer of Infadolan or other very oily substance. That is all. If you have visible vit. C residues on the skin in the morning or the skin feels sticky wash it off with tap water. There might be some white residues if you use high concentration. 3- I recommend a healthy diet, avoiding junk food and especially sugary soda drinks and of course no smoking. External application of vit. C is important because you cannot achieve really high levels in the skin by taking it orally. Various oral supplements can also be useful nevertheless there are no studies showing that specific supplements improved results of any skin procedures so it is not possible to make any such definite lists or recommendations. It is worth trying, that is all I can say. 4- it is just important is not to rub on scabs (if you get scabs after microneedling) because removing scabs prematurely can leave a scar. Otherwise it is OK.
5- No, it is not going to hurt your goal. They should also be kept moisturized after the treatment. To target the pressure massage on very small hypertrophic scars, you can use something small to apply the pressure (the thicker side of a toothpick or something like that).